Dynamic Windows Interface Builder is a simple application for creating user interfaces for application built using the Dynamic Windows library. When you start the application you are presented with the main window, which consists of a toolbar with icons representing every type of control available to the application and an empty properties inspector window which will be filled when a widget is selected. 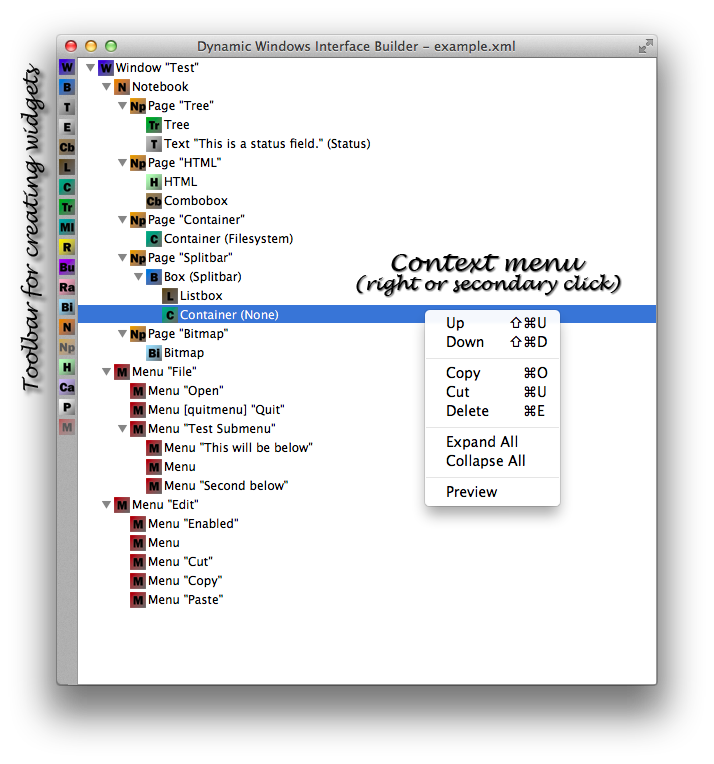 Clicking the icons on the toolbar will create widgets in the tree that represents the layout of windows. Clicking Window will create a new top-level window entry regardless of what is selected in the tree. You can only click Menu when a Window or another Menu is selected. You can only click Notebook Page when a Notebook or Notebook Page is selected. Most other items will be created as a child of the selected widget if the widget is packable (Window , Box , or Notebook Page ) or as a sibling of the currently selected item. The properties inpector window shows the widget properties for selected or new widgets. Live updatable widgets will have a Refresh button to immediately update the associated open Preview window. Most widgets have layout attributes (width, height, expand, padding) which the layout engine uses to size and position the widget. The width and height can be automatically calculated by setting the attributes to -1. Padding is space in pixels surrounding the widget. You can specift the font and colors of the widget using the Font Chooser and Color Chooser buttons. The Locale button located next to label and title fields will bring up the Locale Manager dialog which will let you edit the localized versions of the text.